One blog comment, one chance to win. Join in before Sunday night, ok? My friend and fellow job search expert blogger Joshua Waldman recently published the 2nd edition of his book Job Searching with Social Media For Dummies, and we're throwing this contest to celebrate. At the bottom of this article, leave a comment about job search and social media. 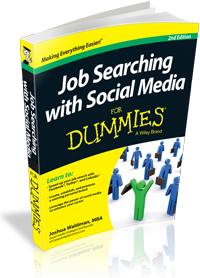 3 free, digital copies of the recently-published Job Searching with Social Media For Dummies (MSRP of US$19.99) are available to be won. I just started using social media in my job search and to help make connections for others. It’s amazing! I am learning so much about what others are doing to showcase their talents, ie. links to video introductions, electronic portfolios, blogs, etc. I’m taking it all in and looking to see how I can use social media to leverage my job search in a way that fits with my goals and style. Thanks! Someone recommended that I use mobile social media as an integral part of my job search. To be more precise, he suggested that I walk up and down the street wearing a sandwich board with my job-search details. I hope that if I get the Job Searching with Social Media For Dummies book, I’ll be able to learn about more advanced social media options. One should use every appropriate online opportunity to advance one’s job search. For example, if one were entering an online job-search competition, one could, in passing, just happen to mention that one has a degree in computer science and that one has produced technical manuals in a wide variety of fields. It may also be useful to mention that one has a number of patents. And if one also has a hobby involving genetic genealogy, it probably wouldn’t do any harm to throw that into the mix as well. As a service to the job-search community, I thought I’d use the social media opportunity provided by this competition to pass on a job offer I just happened to see on the Janglo site. If anyone out there knows someone who is suitable for this position, please pass this on to them. I recently read Joshua Waldmans “Social Media for Dummies” and was immediately inspired to share how important Social Media is for finding and securing employment. As a Career Counselor, it is vital to connect students and folks moving through a career transition with the most relevant career resources to help them be as successful as possible. “Social Media for Dummies” is an essential read for anyone in the Career Counseling and Coaching profession and I would strongly recommend that anyone looking for work or wanting to take their career to the next level to read this book! The winners are Theresa, Y Silver and Gideon. You should receive an email this week with information on how to claim your prizes.